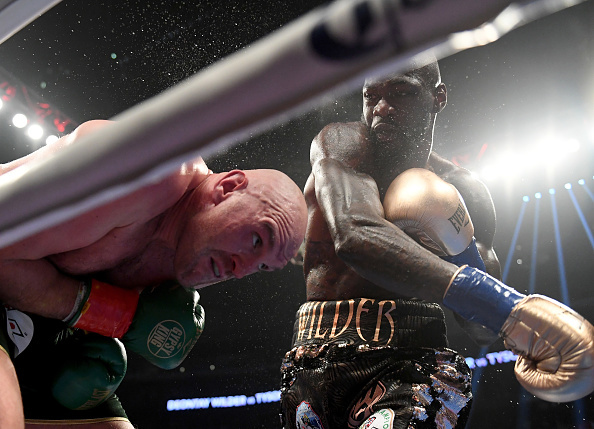 When all the noise quietened down deep into the Los Angeles night boxing fans were left wondering just how so-called qualified judges at ringside could have marked Deontay Wilder and Tyson Fury so differently, writes GARY LEMKE. Yet another major boxing occasion was spoiled by the schizophrenic scoring of the three judges as the highly-charged world heavyweight showdown between two unbeaten fighters, Deontay Wilder and Tyson Fury, ended in a draw. And so, the scene is set for a rematch. Canelo Alvarez was the recipient of two terrible decisions by the Las Vegas judges when he was awarded a draw and then subsequently a points victory against Gennady ‘Triple G’ Golovkin in showdowns between two middleweights and this time the judges declared a draw between Wilder and Fury. Rematch? Both big men immediately declared their desire to do it again. In the United States or England? ‘Wherever there’s more money,’ Wilder, in going the distance for only the second time in 41 contests, said. The judges scored it 115-111 (Wilder), 114-112 (Fury) and 113-113. Two of the judges had the fight a six-point swing, which makes one question whether they were at the same venue. All three judges scored the same in round one (Wilder), round five (Fury), round nine (Wilder), round 10 (Fury), round 11 (Fury) and round 12 (Wilder). Which means that rounds two, three, four, six, seven and eight were a lottery. From the comfort of the TV lounge I had Wilder the winner, 115-114. Fury, who had become a respectable world heavyweight champion when beating Hall of Famer Wladimir Klitschko three years ago, must ge given huge credit for knocking his oversize body back into shape after spiralling into a life of drugs, depression and being banned by the governing authorities. A giant of a man, the Mancunian ‘Gypsy King’, tipped the scales at 116kg, some 20kg heavier than the man they call ‘the Bronze Bomber’, while they were managed to eyeball one another, at 2.06m and 2.01m, respectively. For large parts Fury taunted his opponent, making sexual gestures with his tongue, putting his hands behind his back and spreading his arms to invite Wilder into range, but the American didn’t take the bait. The bookies had made Wilder the favourite, based on his concussive punching power which has starched 39 of his 40 previous opponents. And they’d made the line at nine rounds. And when Fury hit the deck in the ninth round, albeit having two glanced hooks bounced off his shaven head, it seemed that was the right call. But there’s a giant heart beating inside the big Englishman and he got up to win the 10th and 11th rounds. Then, in the defining 12th, the 33-year-old Wilder, a bronze medallist at the 2008 Olympics, finally connected with his right hand. It could be argued that this was the first time in the contest that he’d connected flush and Fury went down like a sack of potatoes, his head bouncing off the canvas. It was all over, it appeared, but somehow the 30-year-old summoned up huge reserves of strength and courage and got to his feet to beat the count. Had Wilder not got the final round knockdown then Fury would have won, because the 10-8 scoring of that round to Wilder allowed him to draw on the card of English judge Phil Edwards. Fury was elusive all night and moves extremely well for such a big man. He also landed more punches and he swelled and reddened the area around Wilder’s left eye. Wilder seemed to have one plan: throw the left jab and then swing for the fences with his right hand. There was no Plan B and Fury is a quality defensive fighter and slipped the vast majority of the right hands coming his way. The ‘other’ undefeated world heavyweight champion, Anthony Joshua, won’t have been unduly phased by what he saw, although he’s previously also tasted the canvas, so would be in danger if Wilder landed that right hand. However, Wilder is definitely beatable – but then again, so is Fury. On the night though, the judges couldn’t separate them.